The Department of Software Engineering at College of Electrical and Computer Engineering held English Leadership Camp for this academic year which is a joint effort by four universities, namely, Chungbuk National University, Korea National University of Transportation, Korea National University of Education, Pai Chai University. Through the English Leadership Camp it is aimed to blend English language teaching and foster potential future leaders with communication skills that are vital in the era of globalization in 21st century. This is an ongoing yearly camp that traditionally culminates in an event of overseas volunteering activity that participants join to perform series of lectures and seminars to a developing country students. Participants of the overseas volunteering activity were selected based on their merit from a list of applicants and therefore appear to be highly competitive and motivated students. The event culminated when three teams were selected for the first, second and third places. The first place winning “Brainstormers” literally stormed the audience with their fantastic presentation skills and cleverly written web site which also had an Android App developed. 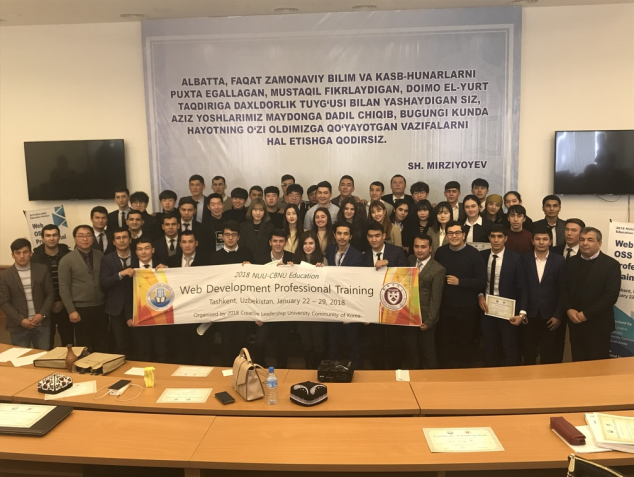 At the same time, “Dream Team” members impressed the jury of professors with their well thought out content rich website which promotes Korean and Uzbek language. The website has various features such as dictionary, audio, video, quizzes, cultural and many other sections in both languages targeted for bi-directional educational effect for language learners of both languages. Finally, the team winning the third place presented their “Happy Math” named project with math rich content aimed at teaching the subject to kids and elementary school students. Great were the projects and so were prizes starting from Galaxy Gear S3 for first place, Galaxy Tab A6 and Samsung Gear for second and third places. 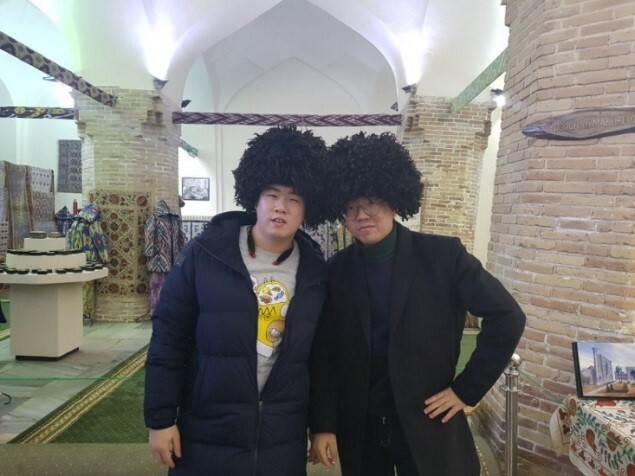 Of course, the volunteering visit is also an opportunity to promote cultural exchange which is why Korean students visited places of cultural importance every evening during their stay in Tashkent. They have visited Amir Temur Museum and Square, Minor Mosque, Monument of Courage and many other places with plenty of Uzbek restaurants to taste the local food. During weekend, visit was paid to the Samarkand via high speed KTX like Afrosiyob train which enabled departure and arrival within the same day. Samarkand is a historical city of Uzbekistan similar to Gyeongju in Korea with lots of places of historical and cultural importance. Overall, the trip was very interesting and full of experience which is why most of the students felt they would stay more days if possible. It is important to note that this event is a result of ongoing cooperation between various organizations of South Korea and Uzbekistan. 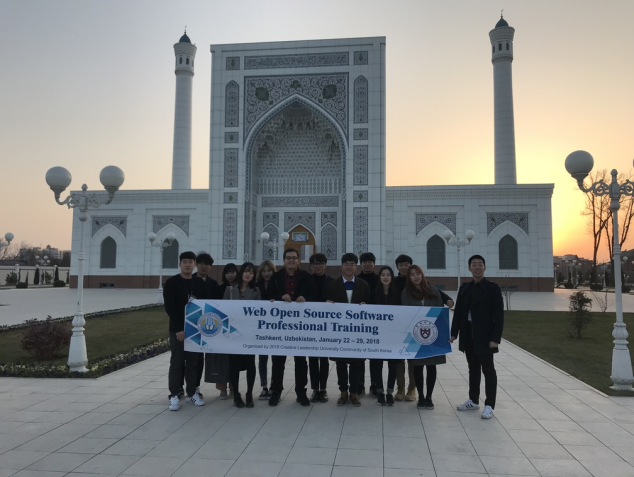 For example, one of the leading universities, Tashkent University of Information Technologies named after Mukhammad al-Khorazmiy (TUIT) and Korean International Cooperation Agency (KOICA) signed protocol on realization of the project “Implementation of integrative educational information system TUIT” in 2018-2021. This project was developed within the framework of cooperation of TUIT and KOICA specialists and envisages creation, development and implementation of “e-learning” (organization of educational process) and “e-library” (electronic library) systems, as well as providing TUIT with technical means necessary for effective operation of all components of developed solutions. In addition, delegation of the KOICA visited Inha University in Tashkent. 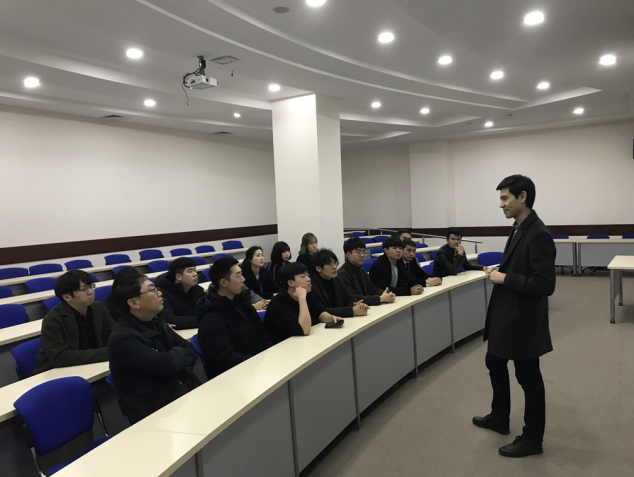 The main purpose of the visit was to discuss the possibility of participation of South Korean experts in raising professional level of programmers of this university. At the meeting, representatives of the university and KOICA discussed issues of developing mutually beneficial cooperation in the sphere of improving the education system and creating new opportunities for young professionals. In particular, the sides considered possibility of attracting new volunteers from South Korea for teaching some disciplines in the IUT. One volunteer, who teaches the Korean language to university students has been already involved with the assistance of KOICA. The relationship between South Korea and Uzbekistan in the field of education is immense too. 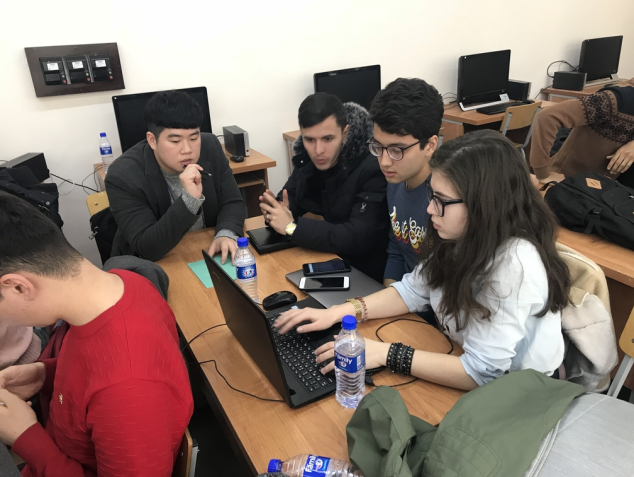 Historically, many students from Uzbekistan come to the leading universities of South Korea to continue their education in Master or PhD programs. Now, there are several Korean education institutions that broadly operate in Uzbekistan. For example, Inha University in Tashkent is the symbol of cooperation between Uzbekistan and South Korea in education and the only fully fledged educational program of the South Korean university in the world. 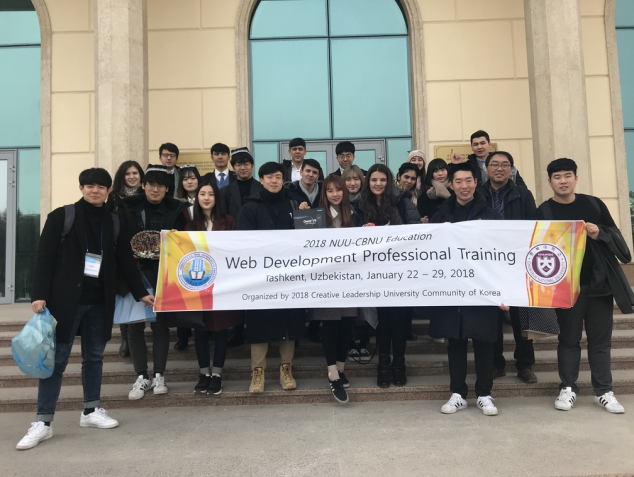 The university in Tashkent was established on the initiative of the President of the Republic of Uzbekistan to develop educational programs for the IT industry, based on the valuable experience of South Korea in IT. There are other South Korea universities are planning to put their marks in education system of Uzbekistan. For example, representatives of the Bucheon University led by Professor Li Dong Wook held talks at the Uzbek Preschool Education Ministry. The sides considered issues on system of preschool education in Korea Republic, training and advanced training of teaching staff, preparing teaching aids, use of multimedia materials in preschools. Protocol of Intention was signed following the meetings on opening of the Bucheon University branch in the city of Tashkent. Also, the University of Sejong will open its branch in Tashkent from the new academic year in September. 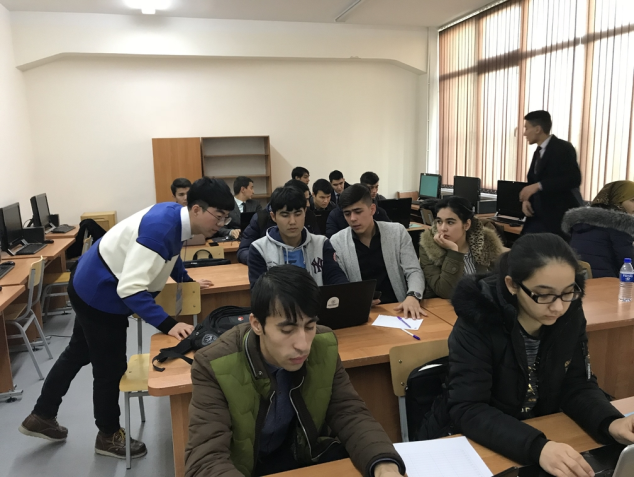 Tashkent branch of Sojong University will offer undergraduate programs in early childhood development, advertising, public relations and tourism. Uzbek Minister of Preschool Education Agrippina Shin and the rector of the University of Sejong Hong Yeung Kim signed a protocol of intentions Thursday to open the University branch in Tashkent. We hope that such exchange programs as overseas volunteering is in the spirit of our cooperation that we have historically found to be very fruitful and mutually beneficial, and hope will serve as an important step for continuous future cooperation between our esteemed universities. prevEducational ties between South Korea and Uzbekis.. COPYRIGHT 206 BY COLLEGE OF ELECTRICAL AND COMPUTER ENGINEERING. ALL RIGHT RESERVED.